Freshens the air and reduces up to 99.9% of Bacteria and Mold on the surfaces in the place it is installed. Also it reduces 90% of Airborne Bacteria, Viruses and germs. We installed the Air Scrubber in July of this Year. They have not had a lot of use in pet facilities but we thought it would be worth a try to see if it would reduce our likelihood of diseases. Since we have installed the Air Scrubber we have noticed a drop in the number of kennel cough cases. We always have a rise in cases during the summer months, and this year we saw the least cases of any year so far. Our New Foster Dog, BUSTER! We currently have two foster dogs at Ruffledale right now. The funny thing about them is they came from different situations but they look like brother and sister. I am writing this because I believe it is a story that should be heard, for animal cruelty awareness. Unfortunately not all our beloved pets have great stories. So I would like to tell Buster's story for awareness and because he is so sweet and deserves to be loved as much as he loves you. Buster is a six year old lab mix, we think he could be mixed with border collie. He is super lovable and loves to be with people and other dogs. He finally is warming up to his enviroment here at Ruffledale and is meshing quite well with the others. I received a phone call from a friend that she had heard about a dog in her friend's neighborhood that had been abandon. The family had lost(foreclosed) on their house and had packed everything up and left. Unfortunately they decided to leave their beloved dog Buster behind, tied to a tree. Buster watched his family drive away, kids and belongings and was left with only a small amount of food and water. When my friend went and picked up Buster he was very sad, severely dehydrated and hungry. They took him and let him recover at their home over the weekend. When I was called I told them that of course we would let him live here at Ruffledale. Now we need to find Buster a new home. Someone who will love him and if a crisis did strike their family that they would take in consideration Busters life too. We promised him that we would love and take care of him until we could find someone to do the same. PET OF THE MONTH FOR AUGUST BUDDHA!! 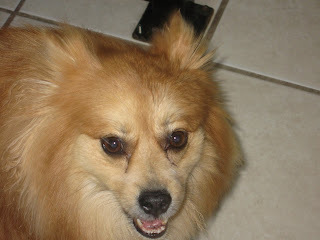 Buddha is a very fun-loving “Giant” Pomeranian! He is always the life of the party when he is here at Ruffledale. He is getting ready to turn four on November 8th of this year. Buddha loves all people and dogs. Kids are his favorite, and he will stop anything he is doing to see a little boy or girl. He is always friendly with everyone. Buddha loves to “talk” but never in a mean way! Buddha loves his stuffed toys, but his favorites are his “lamb,” “baby,” and his “monkey.” Although Buddha loves to play with other dogs in person, one of his biggest pet-peeves is dogs barking on the TV. He must be confused where they are and how he can get to them. Besides dogs on TV, Buddha loves to watch TV. He will stare intently for hours if it is a show he likes! He also hates to see horses being brushed, and gets upset. Maybe because with all of his long hair he understands that brushing is no fun! Buddha loves coming to daycare. He has been a regular here at Ruffledale for years. We all have loved watching him grow up. Buddha usually prefers to play with the big dogs rather than the small ones who are his own size. Sometimes at closing time Buddha isn’t ready to go home and we will have to catch him to send him home. He runs right in without any hesitation no matter how many dogs are at the gate greeting him. He does get a little jealous though if his Mom pets too many other dogs for too long. He will bark and “yell” at her to stop! Not only does Buddha love dogs, but he also loves his cat at home. He is very nice to the kitty and likes to share food!